Note: The color of the item may vary slightly due to photography and your own computer Specification: Contacts Pin Number: 3 Rated voltage: 400V Rated Current: 5A Contact Resistance: less than 0.005ohm Insulation resistance: more than 1000megohm in normal, more than 20megohm after constant temperature test Testing voltage: 1200V Environment temperature: Minus 50 to 70 degree celsius Barometric pressure: 4kpa Weight: 205g Package include: 10 X Aviation Plug Metal Connector Brand Unbranded MPN N08093 EAN Does not apply Manufacturer Part Number Does not apply. Pooleys FBL-8 with LED flexible Torch . REMOVED FROM AIRCRAFT ZG777. A/C TYPE: TORNADO IDS 1. PART: 21-009-01. Jeppesen Professional Pilots Logook Non EASA Edition (ICAO/FAA). Its design matches that of the Airway Manual binders, and it includes simplified pilot and aircraft annual summaries. Version: 10001795-006. The Throttle Butterfly Book Ends are made from original decommissioned throttle valves made for CFM56 Jet Engine. The throttle butterflies have been cleaned up and added to oak backs and bases. About Dappr Aviation. SkyLite Aviation Pilot Headset w/ Gel Seals. ~~ Free SkyLite Headset Bag Included. See Details Below ~~. 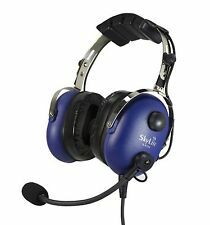 SkyLite SL-900M Features SkyLite SL-900M with Leading Aviation Headsets SkyLite SL-900M. Model: SkyLite SL-900M(B). It has had a alloy plate welded to the bottom for which I would guess mounting purposes. Kj66 Compressor Wheel. Condition is New, unfinished project. Factory balanced. Set of 4 HPC Compressor Rotor Blades. Harrier Jump Jet. Rolls Royce Pegasus Jet Engine. TheRolls Royce Pegasus Jet Engine powers all versions of the mightyHarrier Jump Jet. Vertical/Short Take Off & Landing – the Olympus can direct thrust downwards, through 4 swivelling nozzles at the side of theHarrier fuselage; allowing access to usually impenetrable areas for standard aircraft. 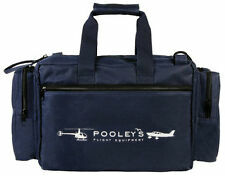 Pooleys Pilots Headset Case (Single). In blue, sealed in it's original bag, brand new unused without labels. Pooleys CBL-8 Kneeboard with flexible LED Torch . Electrical Wiring Loom Protective Wire Conduit – red nylon sleeve. RAF Aircraft. Dated 11/04. We can only export to certain countries. The Baffle Lamp is made from original decommissioned oil pipe and a baffle air start bleed from a CFM jet engine. The base is made in solid oak. About Dappr Aviation. These fantastically engineered parts, made from highly advanced materials, have flown many thousands of miles around the world. Auster / De Havilland Dragon Rapide Windmill Part No. 5U/4528. This windmill is ex Mod still in original wrapping unused with instructions. For wind driven generator. Serial No. will be different to one in picture. Pooleys CB-3 KneeBoard. *Bestseller* . 5-year no-quibble SEHT warranty. Helicopter Connector. Mixture of Aerotight, Philidas and ODDIE nuts. In excellent un-issued condition. Thread length: n/a. Plain length: n/a. Aircraft R.W.E Threat Warning Panel. Transair Headset Case (Single), In black, sealed in unopened original bag, new without tags. Set of 4 HPC Compressor Vanes. Harrier Jump Jet. Rolls Royce Pegasus Jet Engine. TheRolls Royce Pegasus Jet Engine powers all versions of the mightyHarrier Jump Jet. Vertical/Short Take Off & Landing – the Olympus can direct thrust downwards, through 4 swivelling nozzles at the side of theHarrier fuselage; allowing access to usually impenetrable areas for standard aircraft. Clement Clarke AirLite 91 Military, Aviation (CAA/FAA Aproved) Headset. Has twin stereo PO316 Jack plugs. Fitted as standard with a noise cancelling microphone (100 Ohm Electret). HYDRAGAS HYDROLASTIC. GENUINE SCHRADER 556 SEE PHOTOS. FITS ONTO SCHRADER VALVE ON SUSPENSION OF MG ROVER CARS. STRUT COUPLER FOR AIRCRAFT. LOW LOSS CONNECTOR. 1/8 NPT LINE INLET. Garrett AiResearch. Garrett AiResearch GTC85-65 Jet Engine Vane. Hercules Aircraft. Beautiful piece of engineering. We can only export to certain countries. 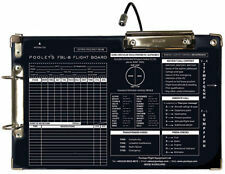 Pooleys iPad Kneeboard suitable for iPad Mini 1 2 & 3 . Nice condition good for late mk 9 spitfire. 3M Peltor 8103 Helicopter Aviation Headset MT52H79F-03 Brand New. Condition is New. Dispatched with Royal Mail 1st Class Signed For. Ex BAE Nimrod XV231 Aircraft. This Nimrod aircraft is preserved at Manchester Airport Viewing Park. We have a number of these available from different Nimrod aircraft . Paperwork shows unserviceable in 2010 as ‘Under reads by approx 100ft’.